Already widely known and lauded by Southern Living Magazine and OpenTable.com for its Sunday Brunch, Hotel Galvez & Spa, A Wyndham Grand® Hotel, is aiming to make its newly renovated $900,000 Galvez Bar & Grill the go-to spot for local seafood and after-work cocktails with the launch of a new menu featuring fresh seafood from Galveston’s Pier 19, steaks and various new bar bites. 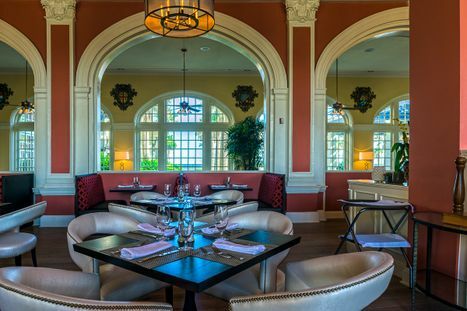 Executive Chef Patrick Havard and Food & Beverage Director Marty Miles have tailored the eatery’s new menu to satisfy the restaurant’s popular requests for local, fresh seafood, while adding a touch of classic Texas and Galveston flavors. With seafood at on the top of many guest’s lists, the Galvez Bar & Grill will now offer fresh Gulf Coast fish and shrimp caught by local fisherman and prepared grilled, broiled or blackened. The menu will also feature the hotel’s award-winning shrimp gumbo, pork chops, soups, salads and free range chicken. For guests craving a Texas-sized steak, the restaurant will serve eight-ounce Certified Angus filets and 16-ounce Rib-Eyes. New sandwich and burger selections will include a variety of Po Boys, a Southwest free range chicken sandwich with cilantro aioli, a pan-roasted or fried grouper sandwich, an old-fashioned-style burger and Texas-style burger with ham, cheddar, bacon and charred jalapeno relish. For dessert, guests will find the hotel’s popular bread pudding, key lime pie and a new buttermilk pecan pie. Galvez Bar & Grill will also expand its bar bites menu to include items such as a variety of sliders, marinated crab fingers, fish tacos, sugar-chili-glazed shrimp, Campechana (a Mexican seafood cocktail) and freshly baked flatbread pizzas, including a creation of Andouille and crawfish. In honor of its historic mahogany bar, which was once located in a former speakeasy named the Old Galveston Club, Galvez Bar & Grill will offer Prohibition era-inspired cocktails including the Galvez Sling, Seawall Sidecar and Bikini Martini, as well as a Ghost Bride Martini, an ode to the hotel’s famous ghost alleged to be seen at the property. The bar area, now with twice the seating capacity, will continue to offer premium wines by the glass, an extensive cocktail and beer section and live music on weekends. Galvez Bar & Grill is open daily from 6:30 to 11 a.m. for breakfast; 11 a.m. to 2 p.m. for lunch; and 5 to 10 p.m. for dinner. Sunday breakfast is served from 6:30 a.m. to 10:30 a.m. to allow for the hotel’s popular Sunday Brunch from 11 a.m. to 2 p.m. The bar hours are from noon to midnight Sunday through Thursday and from noon to 1 a.m. on Friday and Saturday. Children ages 12 and under eat for free with a dining adult. Reservations are available via Open Table or by calling (409) 765-7721. Hotel Galvez & Spa, A Wyndham Grand® Hotel and National Trust Historic Hotel of America, is the only historic beachfront hotel on the Texas Gulf Coast. This 224-room, century-old hotel offers over 13,200 square feet of meeting space, a 9,763-square-foot spa, fitness center, full-service restaurant, lobby bar and pool with a swim-up bar. The hotel is rated four diamonds by AAA and is owned by Galveston preservationist George Mitchell as part of Mitchell Historic Properties. For reservations, call (409) 765-7721, (800) WYNDHAM, or visit www.WyndhamHotelGalvez.com. Wyndham Hotels and Resorts, LLC, a subsidiary of Wyndham Worldwide Corporation (NYSE: WYN), offers upscale hotel and resort accommodations throughout the United States, Canada, Mexico, Central and South America, the Caribbean, Europe, the Middle East and China. All Wyndham® hotels are either franchised by the company or managed by Wyndham Hotel Management, Inc., or one of its affiliates. Additional information and reservations for all Wyndham hotels are available by calling (800) WYNDHAM – (800) 996-3426 – or visiting www.wyndham.com. 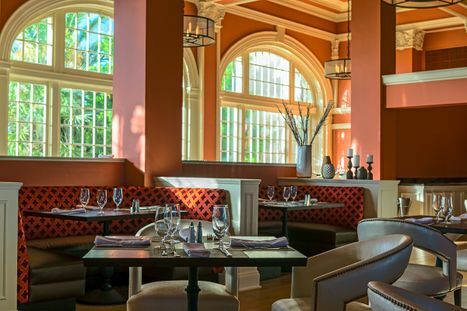 Hotel Galvez & Spa has opened its new Galvez Bar & Grill. The restaurant features fresh, local seafood and Texas regional cuisine. Photo by Vadim Troshkin and courtesy of Hotel Galvez & Spa.